Chicago: The global real estate services and money management firm addresses corporate agility through space planning with a bold approach to redesigning its headquarters. It was a situation where quick communication could make or break the project’s outcome. However, as a global real estate services and money management firm with more than 25,500 employees in more than 450 cities across 50 countries, Jones Lang LaSalle values communication in all of its operations, be they time sensitive or not. Successful communication and collaboration across borders –around the globe and within individual offices – benefits both the firm and clients. When it came to its own offices, however, the 10-year-old space layout in the company’s headquarters was an obstacle to efficient communication and teamwork. Recalling the company’s previous configurations in Chicago’s Aon Center, which the company first moved into in 1996, R.J. Brennan, lead strategist for the space redesign at IA Interior Architects (IA), remembers it as “a very traditional space that was structured with more of a law firm mentality.” Adds Tom Powers, managing principal at IA’s Chicago office, "They wanted to create a professional-service environment and thought that the way to do so was to go with something more traditional.” By 2006, however, the traditional structure no longer fit Jones Lang LaSalle’s business practices. “They had transitioned from being a siloed business to a client-driven business model and needed to communicate easily across all of its lines of business,” Powers says. The company was successfully communicating with its clients, but internally its employees remained isolated in private offices and high-walled cubicles. “The firm was ready to make a significant cultural change to move out of traditional offices and embrace a highly open, flexible environment,” Powers added. 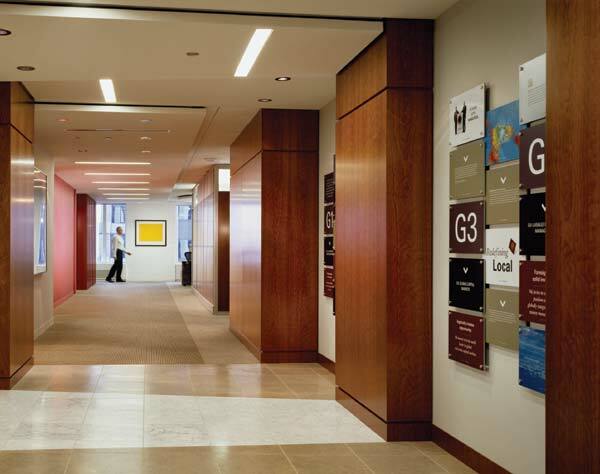 In redesigning its space, Jones Lang LaSalle sought to better foster organic collaboration, reduce real estate and facilities costs, and provide a flexible space that could respond to its agile business. However, changing the company’s approach to day-to-day operations wasn’t as simple as abandoning its previous configurations and diving into an open plan. The results – both in a physical sense and in terms of the company’s business practices – are dramatic. Previously spread out across 131,966 square feet on four floors, the company’s employees had little opportunity for spontaneous interaction, with most people working in assigned spaces and only 16 official teaming rooms incorporated into the design. There were no hoteling options, minimal branding, and no growth ability. In contrast, the new design increases employee capacity, nearly triples the amount of teaming space, and instills a dynamic branding program that connects employees, clients, and goals on a global scale. 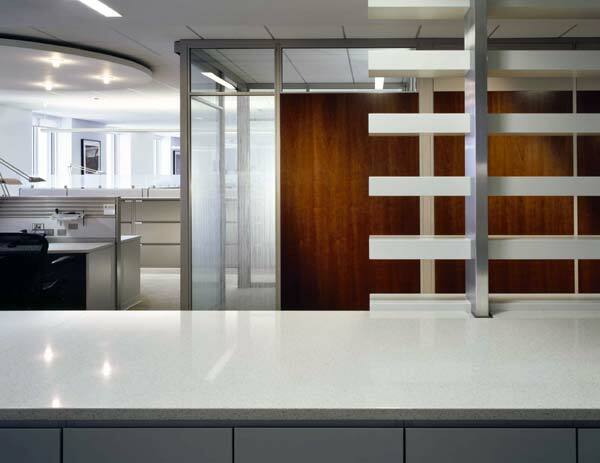 Cubicle walls were reduced from six feet to four feet with glass panel tops that open sightlines across the floor and help spread natural light. Private offices, previously positioned along the perimeter of each floor, were reduced, repositioned closer to the building’s core, and outfitted with glass walls to distribute light and maintain a sense of openness. For the first time, virtually all employees have views to the city’s lakefront and skyline. Recognizing that not everyone requires – or desires – a designated workstation, IA peppered the floors with a total of 39 visitor stations that provide 120-degree workspaces for hoteling employees. And even with the focus on a more collaborative business model, Jones Lang LaSalle and IA acknowledged that private areas were still necessary. 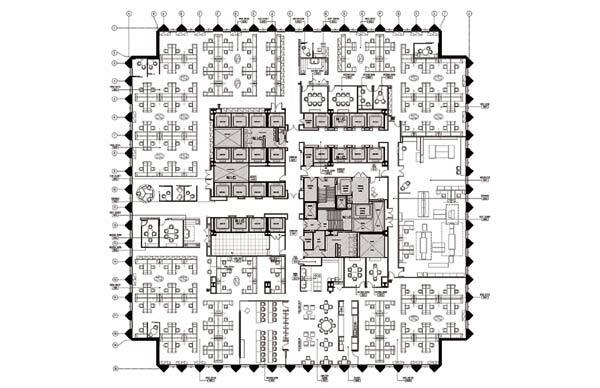 In response, the team developed nine “ISO Pods.” Housed in the cul-de-sacs located at the end of each corridor, these small, full-height spaces are integrated into the open plan and hold one or two people. It didn’t take long to enjoy the benefits of the redesign. Already, the company has saved more than $22.4 million in operating costs (over a 10-year lease) and nearly $10 million in capital costs. In fact, the project has been so successful, Jones Lang LaSalle and IA are implementing similar strategies in other offices around the nation. But the benefits are more than numerical, as time-pressed Dan Ryan soon found out. Instead of taking hours or days to round up colleagues and the missing pieces, in the new office configuration Ryan simply stood up and looked around. Seeing several colleagues nearby, he was able to easily recruit their assistance in gathering the necessary information in time for the team to make its flight. “What that experience underlined for me was the kind of spontaneity and teamwork the new space makes possible when you find yourself in a crunch,” he says. Lighting: Alkco, Delray, Energie, Focal Point, Hess America, Lightolier, Litecontrol, Lucifer Lighting, Lumax, Metalux, Neo-Ray, PM Lighting, Louis Poulsen, Tango Lighting, Zumtobel Staff. Founded in 1984, IA Interior Architects is a global architecture firm focused exclusively on interiors. Ranked as one of the world’s largest interior architecture and design firms, IA provides strategic planning, interior architecture, and design services for corporations, businesses and institutions. The firm has 12 offices in the United States and two international offices (London and New Delhi). In addition, IA has 54 partner offices representing over 1,000 staff, in the Americas, Asia/Australia, Europe, the Middle East, and Africa. This network of offices makes up the IA Global Alliance. Jones Lang LaSalle Americas Headquarters: “neighborhoods” are linked by “information highways” and provide a consistent brand message. Teaming spaces and breakout areas were tripled. Architectural details, such as the ones seen in the coffee area here, mirror the neo-classical exterior of the AON skyscraper (Edward Durrell Stone/Perkins+Will, 1972). 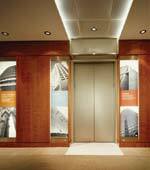 Elevator entryways welcome visitors in multiple languages, reinforcing Jones Lang LaSalle’s global brand. 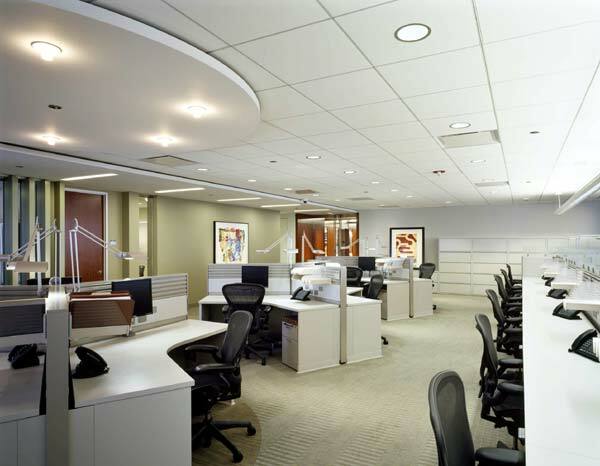 Cubicle walls have glass panel tops to open sightlines and spread natural light. Visitor pods and workstations are used by hoteling employees. 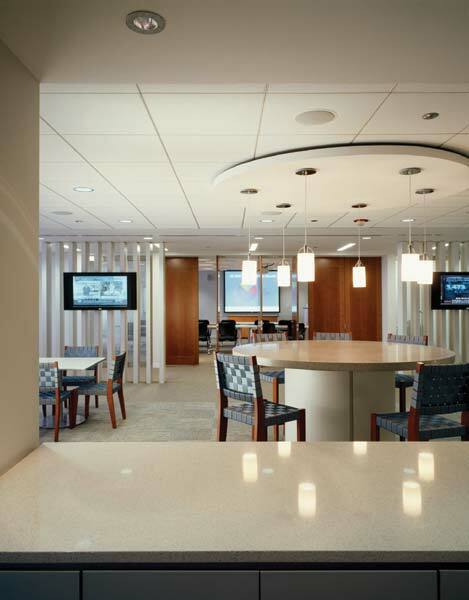 Impromptu breakout areas make last-minute meetings and chance encounters possible. 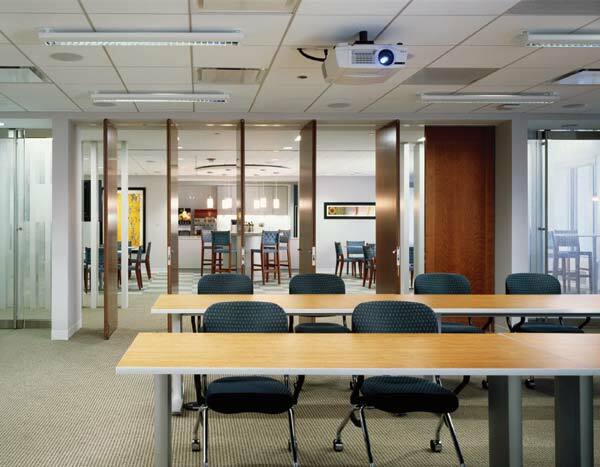 The Pointe is a high-tech conference room used for internal training and client events; doors and panels along its adjacent wall open to the café and allow for increased capacity.